Elephant Exhibit Opening Day Activities! The Milwaukee County Zoo is proud to announce its new Elephant Exhibit, transforming one-fourth of the Zoo’s current layout, will officially open to visitors Saturday, May 4, with a “grand reveal” and special activities from 10 a.m. to 2 p.m.
at 10 a.m.; gather at Sundowner Plaza for opening remarks. 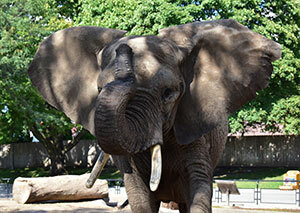 A pair of Elephant Ears will be given to each visitor upon entering Adventure Africa to celebrate the day. on hand sculpting the finishing touches during the event and talking to guests. A Giant Animal Mural, worthy of the huge role elephants play in our natural world, will be on display. Visitors are invited to color a square to add to the mural, signifying the important part people play in protecting this species and hundreds more. Curious why large barrels hang from the ceiling in the Elephant Care Center? This is your chance to find out, with Zookeeper Q & A, as keepers from both the elephant and African hoofstock areas answer questions at 10:30 a.m. and 1:30 p.m.
Take a break during the celebration and visit the Marketplace to purchase an elephant cookie made just for the day. All proceeds benefit elephant conservation initiatives. Join us in Stomping Out the Ivory Trade in Wisconsin and sign a petition to ban the sale of ivory and rhino horn in our state. To date, more than 13,000 signatures have been collected. Travel the exhibits like a member of the herd to learn how the elephants are cared for from specially-trained Zoo Pride Volunteers scattered throughout this area. Various enrichment items to encourage the animals’ natural behaviors along with elephant-related artifacts will be displayed. The new 20,000-square-foot Elephant Care Center features a recreation room with sand and padded floors, and five individual stalls for training, enrichment and medical procedures. The 1.6-acre outdoor habitat features a watering hole, able to accommodate three fully-submerged elephants, feeding and enrichment walls and several shade structures. An Animals-In-Action pavilion with visitor seating allows an up-close look at the exceptional daily care keepers provide to these magnificent animals. Two new mixed species exhibits complement the Elephant Exhibit: the African Forest displays bongo, yellow-back duiker and Kenyan crested guineafowl, and Impala Plains features zebra, impala and African crowned cranes. contact the Zoo’s Marketing and Communications Department at 414.256.5466.